Ivan Basso received a two-year supension for doping today. The 2006 Giro d'Italia champion, who was 3rd in the 2004 Tour and 2nd in 2005, admitted in May that he was a client of Eufemiano Fuentes, the doctor at the center of the Operación Puerto investigation. Basso maintained that he hadn't actually doped, but only banked blood he intended to use at the 2006 Tour. The Associated Press reports that Basso's suspension ends October 24, 2008, because “Basso was already suspended for nearly eight months by his teams this year and last.” Apparently, they're adding the ~6 months, including some outside the racing season, that CSC held Basso out of competition, and the nearly 2 months since Discovery Channel suspended him, and backdating the suspension. That seems a little unfair, since Basso was in competition at the Tour of California and Tirreno-Adriatico during that time. Thoughts? originally uploaded by The Electrician. Defending Giro champion Ivan Basso has left the Discovery Channel team, in the wake of a new look at reports he may have been involved in Operacion Puerto. The Italian, signed by Discovery in December, is scheduled to appear in Rome before his national anti-doping agency this Wednesday after an agreement over the weekend by the Grand Tour organizers to continue to exclude riders believed to be involved in Operación Puerto. Tour de France director Christian Prudhomme still wants riders implicated in last year's Operación Puerto to be banned from this year's race, potentially derailing Ivan Basso's plans to ride for wins in the Giro d'Italia and the Tour de France. Jan Ullrich, who announced his retirement last month, is the only rider currently facing charges for involvement in the investigation. Other riders, including Basso, were named by investigators as possible clients of Dr. Eufemiano Fuentes, but, one by one, the others have been cleared by their national federations. The case was closed when a Spanish judge found that no laws were likely broken in Spain, which had no anti-doping law. Ivan Basso's wrist injury on Friday led him to abandon Tirreno-Adriatico on Saturday morning. Basso strained a ligament in a fall with teammate Vladimir Gusev. He said he narrowly missed a fracture, and that fluid had collected in the injured area. As a result, Basso is likely to miss next weekend's Milan-San Remo. More importantly for Basso's Giro d'Italia preparation, he'll miss today's time trial stage at Tirreno-Adriatico. “I can definitely see that it is not good for our image,” Voigt told ARD. Presumably, Basso won't have to ride this bike in competition, or I'm predicting lots of knee problems for the reigning Giro champ. Reader "Joe" points out that this is a Graham Watson photo uploaded to Flickr, so I've unlinked the version previously posted and linked to Watson's site. Watson also has a “Graham's View” feature on the signing, which he calls “one of the most exciting developments to hit the headlines since many a year,” while admitting the move appears to contradict the ethics code agreed to by the teams in Paris in October. T-Mobile, who dumped Jan Ullrich, his personal coach, and most of their team management in the wake of the Operación Puerto investigation, says Discovery Channel is violating an agreement between teams by signing 2006 Giro winner Ivan Basso, formerly of CSC. New Discovery Channel team leader Ivan Basso told La Gazzetta dello Sport (in Italian) his new team has promised to let him pursue the Giro-Tour double, as he intended to in 2006. “I'm incredibly happy. It wouldn't be an exaggeration to say it's a new life for me - I feel reborn," Basso said. "The squad are committed to supporting me in the double challenge of the Tour of Italy and the Tour de France. Apparently, a number of other managers believed the International Association of Professional Cycling Teams had a gentleman's agreement (read was colluding) to keep Operación Puerto associated riders from signing new contracts unless they undergo a DNA test. Disco Camp starts December 3rd in Austin. cyclingnews.com | Basso to Discovery Channel: "It's done"
Ivan Basso is set to join Discovery Channel for 2007, after being cleared to ride October 27th by the Italian cycling federation. 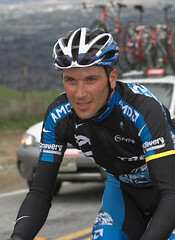 Basso, who won the Giro d'Italia this year, only to have his victory tarnished by unproven allegations that he was involved with Operación Puerto doctor Eufemiano Fuentes, gives Discovery Channel the undisputed GT leader it lacked in 2006. Discovery team co-owner Lance Armstrong confirmed the signing to La Gazzetta dello Sport (in Italian), and CyclingNews reports an official announcement is expected this afternoon in Austin, Texas. One possible fly in the ointment: Basso is likely to be asked to submit to DNA testing, which he and his lawyers have resisted until now. 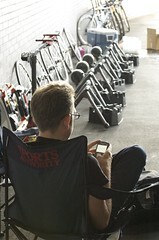 Update: Here's the official release posted at ThePaceline.com (free registration required). IHT.com | Basso hearing in doping case postponed to Sept. 29 Ivan Basso's hearing before the Italian Olympic Committee, originally scheduled for this Tuesday, has been postponed until Sept. 29th. "I feel like an imprisoned man waiting for justice, but the wait is becoming increasingly exhausting every day," Basso said. Basso was one of 9 riders held out of the Tour because Spanish officials suspected him of involvement in the doping ring discovered in the Operación Puerto investigation. Ullrich AND Basso negotiating with Discovery? Eurosport reports that Jan Ullrich is in discussions with Discovery Channel, as both seek to return to the top step at the Tour de France. In an interview with Swiss newspaper Blick (in German), Ullrich said he and Discovery have had contact but have no agreement. 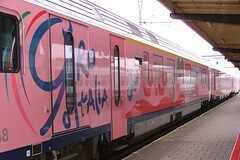 "I have always said I will finish with a Tour victory," said Ullrich, winner in only his second Tour de France, in 1997. "Unfortunately, this year I was prevented from doing so. That's why I will try to add another year." 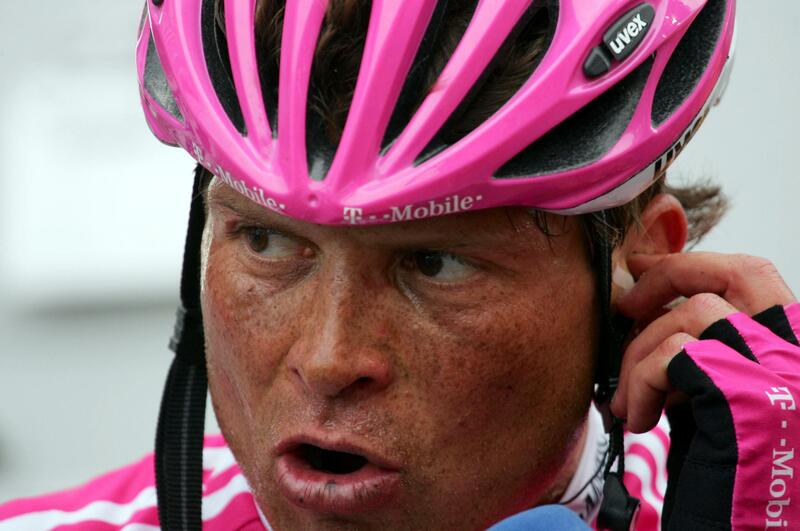 Jan Ullrich continues to maintain his innocence, after being withdrawn from the Tour de France by his T-Mobile team. “The only thing I can say so far is that I'm shocked, that I still have nothing to do with this, that I'm a victim now and that I'm prepared [for the Tour] in this year like never before,” Ullrich told reporters outside his hotel near Strasbourg, before leaving for home. The team says it will demand “evidence of Ullrich's innocence,” or may sever ties completely. "I have nothing to do with all this, but I will let my lawyers speak about this before me," Basso told Italian television. "I'm totally relaxed. I'm waiting for someone to prove to me that I am guilty," said Basso. 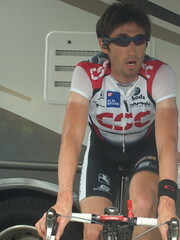 Riis noted that Basso's contract forbids him from working with doctors from outside their CSC team. "Ivan must prove with his lawyer that he is innocent. I believe in Ivan but I have been forced to take the necessary steps," Riis said. Also, the updated official start list is up (check your favorite surviving rider's bib number - Julich gets 11, Klöden 21). The cycling web is buzzing over Bjarne Riis' interview with Danish daily BT (in Danish). Ivan Basso “crossed paths” with Ullrich while both were training in Tuscany, and Riis has heard that Ullrich looks more like Hugo from “Lost” than the 1997 Tour de France winner. Riis rated Ullrich's form as near that of his expected Tour rivals, but well below Basso's fitness level. Of course, every year, Ullrich is reported to look like the Michelin Man during his preseason training, and almost every year, he winds up on the Tour podium. Truth or trash talk? We'll start finding out a week from today, when Ullrich kicks off his season in the Tour of Romandy. "It's a dream podium I'm standing on here. 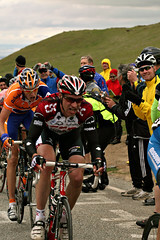 Jan is a special person and a special rival," said Armstrong as he turned to the German. "Ivan, well you are just tough to race against. You're too much of a friend but maybe you're the future of the race for the years to come." Turning to both, Armstrong added: "Ivan, maybe it's your turn next year, or Jan, maybe it will be yours." After briefly criticising the doubters who claim that his exploits have been achieved through illicit means - he has faced accusations of doping in the past - Armstrong had only one thing to say: "Vive le Tour. Forever."